Beautiful certificate from the Wang Laboratories, Inc. issued in 1996. This historic document was printed by the United States Banknote Company and has an ornate border around it with a vignette of the company name. This item has the printed signatures of the Company's President, and Secretary, and is over 17 years old. Wang Laboratories was a computer company founded in 1951 by Dr. An Wang and Dr. G. Y. Chu. The company was successively headquartered in Cambridge (1954�1963), Tewksbury (1963�1976), and finally in Lowell, Massachusetts (1976�1997). 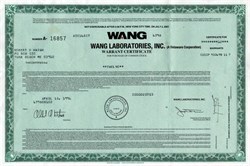 At its peak in the 1980s, Wang Laboratories had annual revenues of $3 billion and employed over 33,000 people. The company was always directed by Dr. Wang, who played a personal role in setting business strategy and product strategy; he also took steps to ensure that the Wang family would retain control of the company even after going public. He created a second class of stock, class B, with higher dividends, but only one-tenth the voting power of class C. The public mostly bought class B shares; the Wang family retained most of the class C shares. (The letters B and C were used to ensure that brokerages would fill any Wang stock orders with class B shares unless class C was specifically requested). Wang stock had been listed in the New York Stock Exchange, but this maneuver was not quite acceptable under NYSE's rules, and Wang was forced to delist with NYSE and relist on the more liberal American Stock Exchange. Under his direction, the company went through several distinct transitions between different product lines. 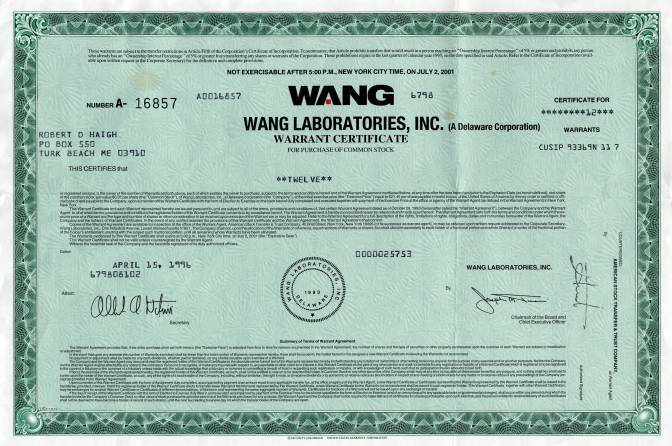 Wang Laboratories filed for bankruptcy protection in August 1992. After emerging from bankruptcy, the company eventually changed its name to Wang Global. In 1999, Wang Global was acquired by Getronics of The Netherlands.